If you’re looking for a powerful laptop that provides some additional horsepower for more demanding tasks, then chances are you’ll be considering a 15-inch laptop. There was a time when your choices were limited to a traditional clamshell, but that’s changing. 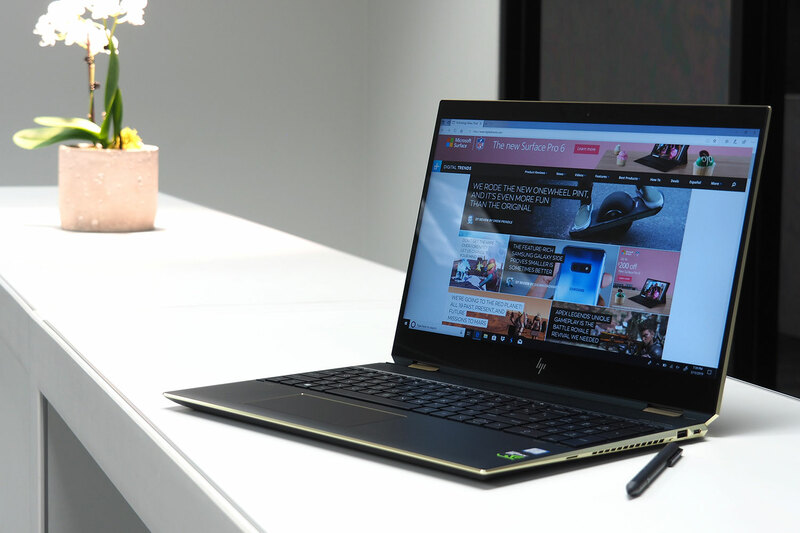 Today, there are more powerful 2-in-1 options that offer higher-end GPUs, and most recently HP released its Spectre x360 15 with a six-core Intel CPU that’s in the same class as you’ll find in laptops like the Apple MacBook Pro 15. We’re going to compare those two laptops here to see if you can get the performance and functionality you want in a modern 2-in-1. Neither of these 15-inch laptops aims to be particularly small, compared to a host of competitors using tiny bezels to fit their displays into diminutive chassis. That’s even truer with the Spectre x360, given that its top and bottom bezels are even larger to accommodate its 360-degree convertible nature. As such, the MacBook Pro is smaller in all dimensions, and it’s considerably thinner at 0.61 inches compared to the Spectre x360’s 0.76 inches. It’s also much lighter at 4.02 pounds versus 4.81 pounds. What you give up in flexibility — the Spectre x360’s display swivel from laptop to Netflix-binging media mode to a very large and cumbersome tablet — you gain in a more comfortable laptop to carry around. Both notebooks enjoy solid build quality, though, with all-aluminum constructions. The MacBook Pro’s chassis maintains the same elegant and understated aesthetic that’s graced the line for a few generations. 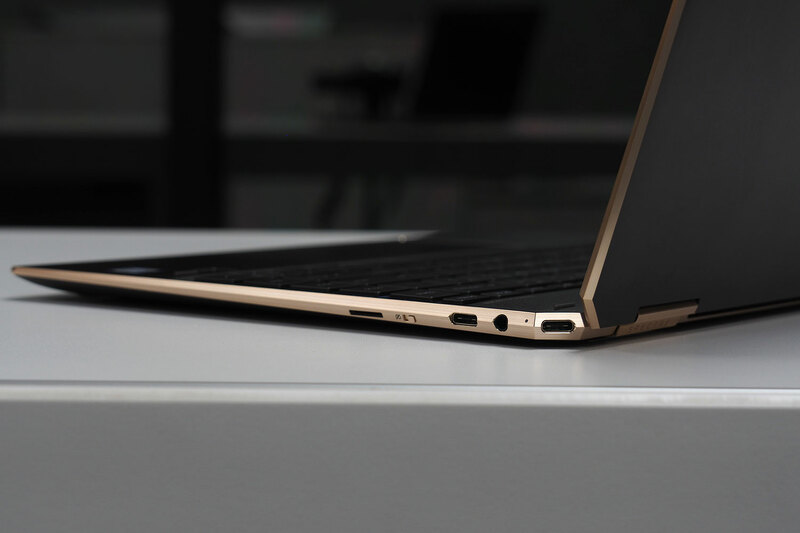 Meanwhile, the Spectre x360 has doubled down on a chiseled metal design that’s at once futuristic and attractive. This generation’s “gem-cut” model looks like a jeweler had its way with the machine, giving it light-catching angles along every side. Regarding input, the Spectre x360 maintains HP’s standard keyboard that offers greater travel and a snappy feel. We like it more than we do Apple’s 3rd-generation butterfly keyboard with its extremely short travel. It’s less comfortable for extended typing sessions. The MacBook Pro benefits from the most massive touchpad around that supports Apple’s Force Touch technology, which outdoes the Spectre x360’s smaller touchpad that uses Synaptics drivers rather than Microsoft’s Precision drivers. Finally, the Spectre x360 offers much better connectivity thanks to its two USB-C ports with Thunderbolt 3 support (supporting dual external 5K displays), one USB-A 3.1 Gen 2 port, and a full-size HDMI 2.0 port. The MacBook Pro forces you to use some dongles, with its four USB-C ports with Thunderbolt 3 support (also supporting dual external 5K displays). The Spectre x360 is the first 2-in-1 with Intel’s 8th-generation six-core CPUs, specifically the Core i7-8570H. That’s a 45-watt part that provides excellent performance for demanding tasks like video editing. The MacBook Pro 15 takes performance up another notch with support for the even faster Core i9-8950HK. The Spectre x360 incorporates the Nvidia GeForce GTX 1050 Ti Max-Q, which is slightly faster than the optional AMD Radeon RX560 available on the MacBook Pro 15. But, the MacBook Pro 15 can be configured with AMD’s Radeon Pro Vega 20, giving it another edge. Also, the MacBook Pro typically has much faster PCIe solid-state drives (SSDs) than its competitors, and it can be configured with up to 32GB of RAM (compared to the Spectre x360’s maximum of 16GB). Finally, we can’t fault the MacBook Pro 15’s excellent display, which is very high-res at 2,880 x 1,800 resolution offers an extensive color gamut with near-perfect accuracy, incredible brightness, and great contrast. It beats out the 4K UHD (3,920 x 2,160) display on the Spectre x360 that’s very good for productivity work but isn’t fit for creative professionals. The MacBook Pro 15 is significantly faster across the board, making it our performance winner. Neither of these is a thin or light laptops, and you’ll feel them taking up space in your backpack. But the MacBook Pro 15 is considerably lighter and smaller than the Spectre x360 15. We haven’t yet tested the battery life of either of these laptops, but neither is likely to last a full working day if you’re running demanding tasks. The MacBook Pro 15 has 83.6 watt-hours of battery capacity compared to a very similar 84 watt-hours in the Spectre x360 15. Both have high-resolution and power-sucking displays and fast components, and so they’re both likely to enjoy similarly limited longevity. The MacBook Pro 15 isn’t the smallest 15-inch laptop around, but it’s nevertheless more portable than the Spectre x360 15. The MacBook Pro 15 is a very expensive laptop, starting at $2,400 for a six-core CPU, 16GB of RAM, a 256GB SSD, and a Radeon RX555X. It jumps up to $7,050 when configured with a Core i9, 32GB of RAM, a Radeon Pro Vega 20, and 4TB of storage. Wow. The Spectre x360 15 is almost a bargain by comparison, coming in at $1,720 with a Core i7-8750H, 16GB of RAM, and 256GB SSD. It maxes out at $2,460 with 2TB of storage. The Spectre x360 15 is the fastest and best-looking 2-in-1 you can buy today, but it just can’t keep up with the mercilessly fast MacBook Pro 15.